Scrivener is a software application created by Literature and Latte and used by many writers. It provides a wide range of features to help writers organize their material, do research, create plots and outlines and much more. In this Scrivener review, we’ll be looking at some of the main features of Scrivener, provide all the updated and valid Scrivener coupon codes below and also explore a great course (along with a coupon) that helps users master Scrivener in less than a week. For the Windows version, click here and use Scrivener coupon code REDDIT(20% off) or coupon code WORDSWITHJAM (20% off). For the Mac version, click here and use Scrivener coupon code LEARNSCRIVENER which gives a 20% discount. You can also download it directly from the Mac App Store, but you can’t use a discount coupon code in the process. If you’re looking at the Scrivener Education License, mind that coupons don’t apply to these discounted licenses. In fact, you’d be better off getting the regular license and using the coupons listed above. The long-awaited Scrivener for iOS is here (priced at $19.99). A 50% Scrivener discount is available for all NaNoWriMo winners. If you completed the challenge of writing a 50,000 words novel, you are a winner and you will find your Scrivener discount code on NaNoWriMo’s Winner Goodies page. The ‘Scrivener Unleashed‘ Scrivener tutorials are currently 70% off (just $49 instead of $149). Get an additional 30% off ($34.30) by entering coupon code ARYE30 on the checkout page. For the full Scrivener Unleashed review click here. Please comment below with your discount redemption success to help our community be up to date with what’s working right now. If you’re a writer, you must compose your manuscript using some type of software -that is, unless, you prefer an anachronistic tool such as a pen or manual typewriter. Most writers rely on a word processing program, in most cases Word, either for Windows or Mac. Word is comprehensive and useful software, but it’s not made specifically for writers. The same is true for any other word processing program you might be using. Scrivener, on the other hand, is created exclusively for writers. So, when you sit down to do your writing, you can simply click on Scrivener rather than Word. One of the biggest challenges facing writers is to stay on track and achieve daily goals. Scrivener has several features that help you do just that. You can set targets for words or characters for each writing session and view how far you are from your objective. You can set Project Targets for both individual sessions and the entire project. For example, if you’re writing a 100,000-word novel and aim to write at least 1,000 words per session, you can always check to see what you’ve accomplished so far. Scrivener also gives you a way to block out distractions. If you’re like many people, you’re constantly tempted by social media, email and the latest headlines streaming across the web. When you want to focus solely on your writing project, you simply enter the Full-Screen mode (for Windows) or Composition mode (for Mac). You’ll only be able to see your writing screen in this mode. You can also edit the background and images to whatever helps you concentrate best. Scrivener makes it simple to write in different styles and formats. This includes templates for composing term papers, dissertations and essays in academic styles such as MLA, APA and Chicago. There are even tools to help you include scientific or mathematical data in your work if you’re writing on scientific or technical topics. You can also use Scrivener for scriptwriting. You can format your script as well as compose treatments for your screenplays. The software is also compatible with scriptwriting programs such as Final Draft. If you’re writing a novel or other long document, you probably have lots of notes, ideas and research connected with your project. Keeping track of everything can be difficult. Having to find a certain note, link or image can really slow you down and halt your momentum. Scrivener lets you import files, links and documents so that you have everything at your fingertips. This is especially useful if you write on multiple devices. This way, everything you need will be in one place whenever you want to write. Storyboarding is a technique many writers use to organize the chapters or scenes in their book (or script). The traditional, pre-internet way to do this was to write out scenes on index cards. That way, you can look at individual scenes and decide which order to put them in. Doing this on a conventional word processing program isn’t too easy. If for example, you write a new document for each scene on Word, you’d have to open up each document separately to see them. Scrivener, though, has a tool called The Corkboard, which lets you view multiple documents as index cards. This lets you get an overview of your book, giving you ideas on what to add, delete or rearrange. Outlining is an important function in writing, whether you’re composing a novel, nonfiction book, term paper or screenplay. Scrivener’s Outliner lets you organize your text in the way that’s most convenient for you. You’re able to create folders for as many levels as you need. For example, your book may be organized with folders for Sections, Chapters, Scenes and Actions. When you want to go back and rewrite, edit or expand something, you click on the appropriate folder and make the changes. Learning how to use the Outliner may take a little practice, but it’s a tool that can help you organize your writing. Many writers today self-publish on Kindle or other online platforms. If you compose your book using Scrivener, you don’t have to worry about getting the formatting right. You can export your document to formats such as MOBI or EPUB for Amazon. You can also export it into other formats, including PDF, TXT, RTF and DOC. This makes it convenient if you want to publish your book in multiple formats. Scrivener comes in both Mac and PC versions. The Mac version is compatible with Apple operating systems 10.12 (AKA Sierra) or later. There’s also a recently added iOS version, so you can use Scrivener on your iPhone or iPad. The PC version is compatible with all popular Windows platforms, including XP, Vista, Windows 7, Windows 8 and Windows 10. The current price of Scrivener is $45 for both the Windows version and the Mac version. There’s also a 30-day free trial for both versions. The Scrivener discount coupon codes below are currently available for new users. There aren’t any Scrivener coupon codes applicable to the Scrivener Mac/Windows bundle (priced at $75). However, if you purchase the two separately using the above 20% discount coupons, you get both for $72. There are no Scrivener discounts on the educational licenses neither, as they are already discounted as is. A more user-friendly and modern interface. Even fans of Scrivener have complained about the steep learning curve and less than intuitive interface. The new version is vastly improved in these areas. Styles – A simpler system for formatting your document. You may want, for example, different font sizes, headings, block text, or titles in different areas. This is similar to the Styles feature you’ll find in word processing programs such as Word. Quick Search – Let’s you quickly find any document. Enhanced Self-publishing – Epub 3 compatible and easier export to Kindle. Storyboarding Upgrade – Index cards, as noted, were already a useful tool for organizing your writing. Now you can view index cards on colored threads, making it easier to highlight and differentiate your scenes, storylines, chapters, etc. Dialog Focus – This is a powerful feature for fiction writers who can focus on all the dialog in their manuscript. Bookmarks – This feature replaces the old Project Notes, References, and Favorites and makes it easier to view documents that you use frequently. You can bookmark not only documents within Scrivener but anywhere on your computer or on the internet. MultiMarkdown Export – There are now expanded capabilities for exporting your documents into different formats. MultiMarkdown (MMD) allows you to convert into almost any word processing format. Simplified and Enhanced Compile – When working on longer documents, compiling is an important function. This is what lets you change the order and put together different sections, chapters, paragraphs, or scenes. The old Compile feature was powerful but many users found it difficult to use. In Scrivener 3, it’s been simplified and made more flexible, with the window divided into 3 easy to see sections. Metadata – The new metadata features help you track and categorize your documents. You can now add checkboxes, lists, and dates so you can remember important aspects of your work. You can, for example, create checkboxes such as “needs images” or “complete,” or “add footnotes.” This metadata can be brought up in Outliner or Compiler. Writing Statistics – Lets you keep track of how much writing you do every day. This is another useful tool for setting goals and tracking your progress. These are some of the most notable upgrades and changes that come with Scrivener 3. If you purchased Scrivener 2 after August 20, 2017, you can upgrade for free. If you have an older version of Scrivener, you can upgrade for $25 by following this link and clicking upgrade page. New users can purchase Scrivener for a one time fee of $45. Helps you with organizational tasks such as outlining and research. Helps you focus on your writing and avoid distractions. There’s a learning curve. Because it has so many features, it takes a little time to learn how to get the most out of Scrivener. Requires a small investment. If you already use a tool such as Word, you may be reluctant to spend money on software for writing. Who Can Benefit From Scrivener? If you do any significant amount of writing for your profession, Scrivener is worthy of serious consideration. Students, novelists, writers of nonfiction, bloggers, content marketers and screenwriters are just a few of the people whose lives can be made easier with Scrivener. If you fall into any of these categories, it’s a solid investment that can make you a better and faster writer. The cost, which is a one time fee of less than $50, is not very significant in the long run if you use the software every day, as many people do. One reason why some people hesitate to buy Scrivener is that they worry it will take too long to learn. They don’t want to have yet another piece of software on their hard drive that remains unused. While Scrivener is a fairly intuitive and user-friendly software, it does contain lots of features, which means there’s a certain learning curve involved with the process. Someone has come up with a solution to this –the Scrivener Unleashed course. [contact us to get a discount on the Scrivener Unleashed course]. Mastering the Corkboard -This is what allows you to organize your material in the most efficient way possible. Navigating the Scrivener window so you know where everything is. Using the Outliner to help you stay on top of large projects. How the Binder gives you visual access to all of your writing. Setting up Scrivener in one hour, either on Mac or Windows. The course has two different versions, one for Mac and one for Windows users. Buying the bundle will give you access to both courses material and to the Scrivener for iOS course as a bonus, all for $79. The price for each individual course, which includes 200+ video lectures is currently $49 (or $39 for iOS only). You can contact us to get an additional exclusive Scrivener Unleashed discount. All versions of the course come with several bonuses, including inspirational background images, Done-For-You templates and a list of tools and resources that will help make you more creative and productive. Scrivener Unleashed is a polished and comprehensive course that allows you to gain the maximum benefits from Scrivener, the world’s leading software application for writers. You can contact us via our contact form or at info[at]impromocoder.com and ask for our exclusive Scrivener Unleashed discount promotion. Hi Gail, your Scrivener license should work on 2 computers simultaneously. If you still have issues, I recommend you to turn to Literature&Latte support here. Scrivener discounts are not 50% anymore… now 20% off ($8 Windows/$9 MAC). Is Scrivener still discounted? and does it work on windows 10? Hi Caitlin, Scrivener works flawlessly on Windows 10. As for the Scrivener discounts, the ones above are monitored regularly, and are currently active. my dissertation. Is that possible? Do you have recommendations? Scrivener comes with an interactive tutorial project (available from the Help menu inside Scrivener). This should help you learn Scrivener’s major features before you start your own projects. The interactive tutorial is a great way to get to grips with how Scrivener works. If that won’t do, we sent you a couple of recommended tutors and classes to your email. Looking at Scrivener for first time. I just completed a technical manuscript in MS Word (2007). My document has dozens of technical drawings done in MS Visio that illustrate various points in the document. I used the technique of inserting text boxes, anchoring them to related paragraphs. Question: If I import this document into Scrivener, how will these graphics be handled? Will they import ok? Will they remain anchored to the related paragraphs? Good question, Kip. I recommend turning to Scrivener support on this link to get a complete answer. Otherwise, I’d recommend giving Scrivener a try (there’s a 30 day free trial version) and see how that imports. On November 24 I purchased Scrivener, with the NaNo discount for $32. My NoNoWriMo subscription has expired and I have no access to Scrivener. Can you send me something to download? Hi Cheryl, a Scrivener license never expires, unless you had the trial version. Please contact Scrivener’s support on this link. 1. We missed your Writer’s Month discount (and we could REALLY use it). My wife is an elementary Special Education teacher and wanted Scrivner for her (December) birthday. She is quickly nearing completion of a novel that currently numbers around 100,000 words. Is there any way we can get a refund of the difference? 2. I looked for your (?your sponsors?) fast-start GUIDE ebook. Please send link. Thank You! Hello Bille, Scrivener offers occasional discounts, if you hurry there is a 25% discount right now with coupon code winterfest2016, but it won’t last much longer. If you have any other questions, you are welcome to contact us. I use Dragon Speaks due to severe arthritis. Will there be a problem using it with Scivener? I have never used this program but have heard so many great praises for Scivener. Hi Donna, Scrivener works great with Dragon Dictate (and some other dictation software as well). You can see a short sample video here. Yes, I am one of those terrible people who make a pretty good living selling “books” written fro the Kindle. I have put together a system that allows me to generally FLY through the creation of “book” so for anything that could supercharge my workflow, I sit up and take notice. So I am writing you today. I am generally regarded to be perhaps the only living relative of the great Ebenezer Scrooge, so I am always, perhaps even more often than that, interested in a bargain. As I see it, I can get the Windows 10 version Scrivener for $40 less a 25% coupon. Fair enuf. I also believe I will get a coupon for 33% off Scrivener Unleashed. Is my understanding correct? Is that the best deal or are there bundles that exist that would be a better deal? Hi Tim, your understanding is correct, that is the best deal right now. You can bundle the Mac and Win versions but the coupons will actually get you a better price buying separately. Hi George, look in your email for a message titled “[Literature & Latte] Order Confirmation”. This email should have your Scrivener registration information and serial number. If you still can’t find it, visit this page for serial number retrieval. .
Ok, great introduction on the video, great and all, but is there any of those videos for those that have a PC? The software isn’t always the same. I’m reluctant on buying anything I don’t understand or not familiar with its functionality. Seeing one of these in the PC version would put my mind at ease and help me feel better about purchasing it. I currently use Word and its never failed me, but I think I’m outgrowing it since my books are 500 pages + now. Its really starting to slow down so I separated the chapters by folders so word doesn’t have to take on such a load. I just qualified for a discount on Scrivener as a Camp NaNoWriMo winner. The instructions say to access it through the NaNo website and it will begin downloading immediately. I already have a trial version on my laptop. Will I lose what I already have on that version? How should I best proceed? Hi Jeanette, congratulations for completing Camp NaNoWriMo! Look at your winner goodies for a 50% off Scrivener coupon code. Since you already downloaded a trial version, you don’t need to download it again. Use your coupon code on the checkout page, after you select the license you need. Then, you can use the acquired serial number on your trial download (either immediately, or once it expires). I have Apple devices. I have Microsoft Office, and I write in MS Word for Mac. Will Scrivener edit docs saved in Word for Mac? Also, if I want to edit while writing on my lPad, do I have to buy a separate app for iOS, or do I get the iMac and iOS apps for one price? You can import MS Word files into Scrivener. Scrivener for iOS requires purchasing a separate license, which costs roughly half the price of the Scrivener for Mac license. You can then sync your writing between devices using cloud services such as Dropbox. Can you work on two different computers and have it stay synced? Hi, I’m writing a history book and have been advised to use Adobe InDesign for book layout for submission to Amazon for a print book. However, Adobe prices are horrendous – will Scrivener do the same job as InDesign ? Hi Richard, InDesign may complement Scrivener on the design side but the two are not substitutes. I have Scrivener 2 for Mac purchased in 2016. It won’t open now apparently due to MacBook going to 64 bit code while my version of Scrivener is 32 bit. If I order a new version using the 20% off coupon, will that be the Scriverer 3 for Mac, or will I need to upgrade later when its available? At what cost? Hi Roger, all new purchases of Scrivener for Mac are purchases of V3, so yes, you will be buying the latest version. You can use the current 20% discount, but as a previous version owner, you can get it at a bigger discount, for just $25. Please read the info above in the article about the Scrivener 3 release, and you will find more info on how to upgrade with a special discount. 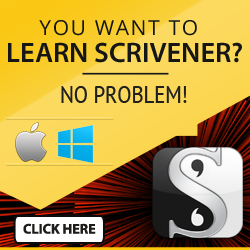 Is there a discount for purchasing the Mac and iOS version of Scrivener? I use my desktop occasionally and my iPad Pro mostly, but I like the added backup of being able to switch between devices. For example I have both the desktop and iPad version of photo editing software, Affinity. You can get 20% off the Scrivener for Mac license and the iOS app is currently roughly half that price, $19.99 USD. I primarily write on my PC (and in word so far) but my husband just got me a laptop to help with writing on the go. I am looking at scrivener as an alternative to purchasing a second license of word. Can I work easily between the two? I do have google drive fwiw. What about if I decide to switch exclusively to scrivener for both pc and laptop? Is there a way to sync my files or do I have to save through the cloud? Hi Amanda, you can import/export from/to Word but it would be a hassle to do that every time you want to work on a different computer. One Scrivener license is good for all your household computers (as long as they all use the same operating system, Windows in your case). You will then sync your work on your devices using a cloud service, many use Dropbox for that. Hi Angela, You can use Scrivener on more than one of your personally owned devices, as long as they have the same operating system. So, in case your computer breaks, you can install Scrivener on your new computer. You have several options to back up your Scrivener files; on your computer, cloud or external drive. You can always download the Scrivener software again, so you don’t need to save it in multiple locations (unless you are using it on those locations/devices). Want To Learn Scrivener Fast?